I'm a member of Hyde Boats Pro Staff, one of only four women in the U.S. and Canada. When they offered to make me a one of a kind boat, I'm not sure they were very excited when I chose teal, pink and purple. When I arrived in Idaho to pick it up, I was in awe. My drift boat exceeded my highest expectations. We met the people that were involved in the design and making of Hyde's prettiest boat. I was so touched by the pride and talent that each one of them had. They have a commitment to excellence and their workmanship shows it. They truly made me a custom boat that has everything I asked for. Hyde’s first ever pink, teal and purple Limited Edition drift boat was made for Char Bloom and boy does it look hot! 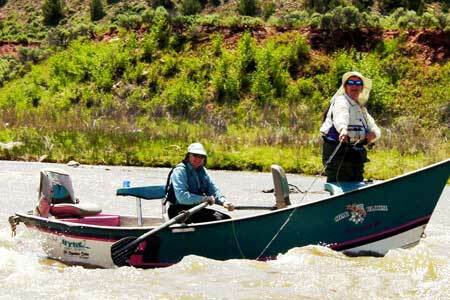 Char is a designer of women’s fly-fishing clothing in Keystone, Colorado. All of us at Hyde Boats were so excited to create a boat for a female Pro Staff member. The personalizing and customizing of her boat, from the pink storage boxes to the custom teal trailer with aluminum rims, matched her exciting and fun-loving personality. I was privileged to go with her on its maiden voyage. Did we turn some heads that day! The fish even showed their love for the new boat by letting me catch a few. It was very cold that day but Char, used to living in the top of the mountains, didn’t mind. As most of us know, the fishing industry isn’t where one makes millions but I wouldn’t trade the friendships I have made for any amount of money. Char Bloom is, as the Lord put it, “The Salt of the Earth”. Thanks so much for your friendship to my family and myself. Home | Products | Other Services | About Char | Contact ©2005 Char Bloom, Inc. All rights reserved.